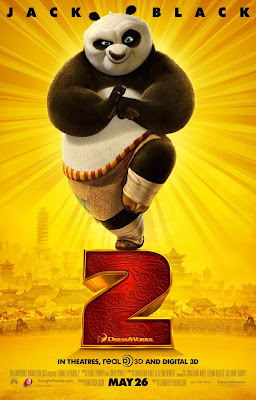 Kung Fu Panda 2 is a 2011 3D American computer-animated action comedy film and the sequel to the 2008 film Kung Fu Panda. The cast of the original film reprised their voice roles. The film was released on May 26, 2011 in Real D 3D and Digital 3D. Long ago, Lord Shen (Gary Oldman), heir of the peacock clan that ruled Gongmen City in China, sought to harness the power of fireworks as a weapon with which to rule the entire country. When he learned from the court's goat soothsayer (Michelle Yeoh) that "a warrior of black and white" would one day defeat him, Shen assumed she was referring to the giant pandas and had them exterminated to avert the prophecy. Shen's parents were horrified at this atrocity and exiled Shen, who swore revenge. Twenty years later, Po (Jack Black) is living his dream as the Dragon Warrior, protecting the Valley of Peace alongside his friends and fellow kung fu masters, the Furious Five, but is told by Master Shifu (Dustin Hoffman) that he has yet to achieve inner peace. While fighting off a pack of wolf bandits who have been stealing refined metal for Lord Shen, Po is distracted by a symbol on the head wolf's (Danny McBride) armor, which causes Po to have a flashback of his mother and allows the wolves to escape. Po asks his goose father, Mr. Ping (James Hong), where he came from, but all Ping can tell him is that he found Po as an infant in a vegetable crate and adopted him. Afterward, Shifu receives word that Master Thundering Rhino (Victor Garber), leader of the kung fu council protecting Gongmen City, has been killed by Lord Shen with his newly developed weapon, a cannon, which threatens to destroy kung fu tradition. Po and the Five go to stop him, reaching Gongmen City to find it under the control of Shen's forces. The heroes find two imprisoned council members, Masters Storming Ox (Dennis Haysbert) and Croc (Jean-Claude Van Damme), and ask their help to liberate the city, but both masters cite their helplessness against Shen's weapon and refuse to escape. Po and the Five are then discovered by the wolf leader, who they chase to prevent him from alerting Shen, only to be captured. Upon being brought before Shen in his tower, Po and the Five free themselves and destroy Shen's cannon. However, Crane burns his wing and Po is again distracted by a flashback upon seeing the same symbol as before on Shen's plumage, allowing Shen to escape and destroy the tower with an arsenal of cannons. After escaping, Tigress (Angelina Jolie) confronts Po over his distraction. Po explains that he remembers Shen's presence on the night he was separated from his parents, and wants to question Shen about his past. Though empathetic, Tigress orders him to stay behind for his own safety. Po regardless breaks into Shen's cannon factory to confront Shen, inadvertently foiling the Five's attempts to destroy the factory. Shen claims that Po's parents abandoned him before he blasts Po out of the factory and captures the Five. Po is rescued by Shen's soothsayer, who has been exiled by Shen to the ruined village where Po was born. Guided by the soothsayer to embrace his past, Po remembers that his parents had endangered themselves to save him from Shen's forces, his mother hiding him in a crate before she was subdued. Attaining inner peace, Po returns to Gongmen City to save the captive Five from being executed by Shen at the city harbor. During the ensuing battle (in which Shifu participates after having persuaded Ox and Croc to do the same), Po uses his inner peace to gauge Shen's cannon fire and redirect it against Shen's armada. He then urges Shen to let go of his own past, but Shen refuses and attacks Po until Shen inadvertently slashes the ropes holding up his last cannon, which falls and crushes him to death. Victorious, Po returns to the Valley of Peace and reunites with Mr. Ping, declaring him to be his father. At the same time, Po's biological father (Fred Tatasciore) is shown to be alive in a hidden village inhabited by surviving pandas, sensing that his son is also alive.